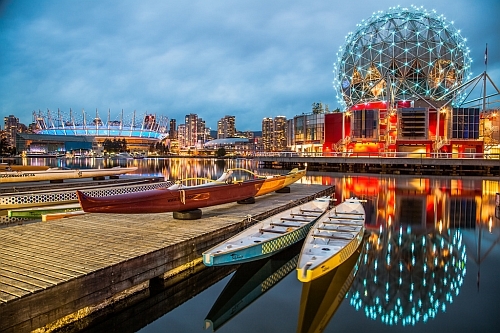 Flair Air (formerly New Leaf) is showing non-stop flights from Kelowna to Vancouver for travel in April and May for $98 CAD roundtrip including taxes. 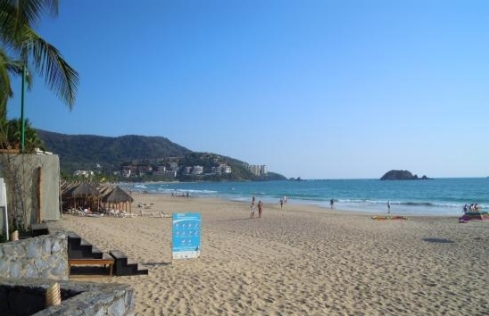 There are some Wednesday to Monday trips available. 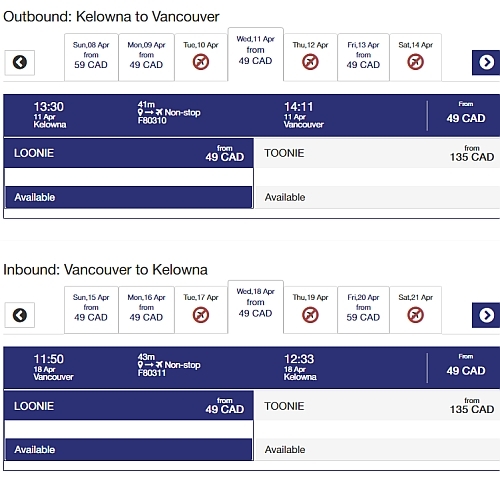 Vice-versa trips (eg: Vancouver to Kelowna) are also available for the same price. - Look for the $49 dates. NOTE: The Flair Air website interface could use some work. First you need to click on the Outbound flight, and then you need to click *again* to select the 'Loonie' fare type. The word 'LOONIE' should now be highlighted in blue. Now do the same thing for the Outbound flight. The code expires tonight (March 26th), at 10 PM PST. It is valid for all Flair Airlines flights, to all destinations, on all dates. - Look for the $49 dates in the months listed above. The price should drop on the next page, after you select the flights. 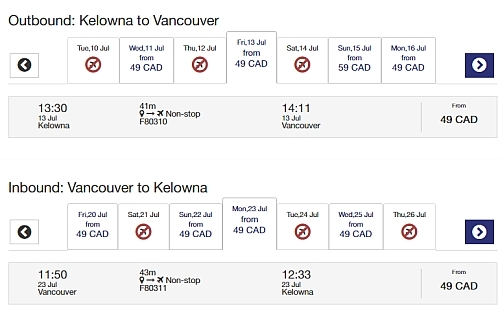 Update 3/27 - Flair Air has a new code out today that brings the price of Kelowna - Vancouver flights in late June, July, and August down to $66 CAD roundtrip including taxes. Flair Air doesn't give any indication for how long this code will work. My guess is it will be valid until a certain number of seats are sold. It is valid for all Flair Airlines flights, to all destinations, for travel between June 24 and September 2. - Look for the $49 dates between June 24 and September 2. The price should drop on the next page, after you select the flights.